As my site name implies, and just in case you were wondering, I’m a guy (a dude, a male-type person, a gentleman-ish bloke, you get the picture). Perhaps because of my Y chromosome, there are some things that I seem to worry less about than does my beautiful bride (ALERT: Potentially sexist-sounding stuff coming, none of which I intend in a sexist way…NOW!). For example, I can walk past a sink that is half-full of dishes or return an empty jar of peanut butter into the corner of a semi-disorganized refrigerator and it doesn’t bother me in the least! Meanwhile, my wife grinds her teeth and wonders why I don’t see the obvious DISASTER in our home (OK, no e-mails, please, unless they are condolences for my wife: I acknowledge that this difference may not be gender-related at all! Perhaps I’m simply still stuck in my bachelor years?). One of the lesser-known benefits of dude-hood is that there is one other thing I never worry about: Whether or not I will have an acceptable hemoglobin level when I go to donate blood! But, thanks to changes U.S. blood collectors are implementing in 2016, I may have to add a new worry to my list. WAAAAY back in November 2007 (that’s not a typo! ), The United States Food and Drug Administration (FDA) published a proposed rule entitled, “Requirements for Human Blood and Blood Components Intended for Transfusion or for Further Manufacturing Use” (you’ve gotta hand it to the FDA; they come up with truly snappy titles!). 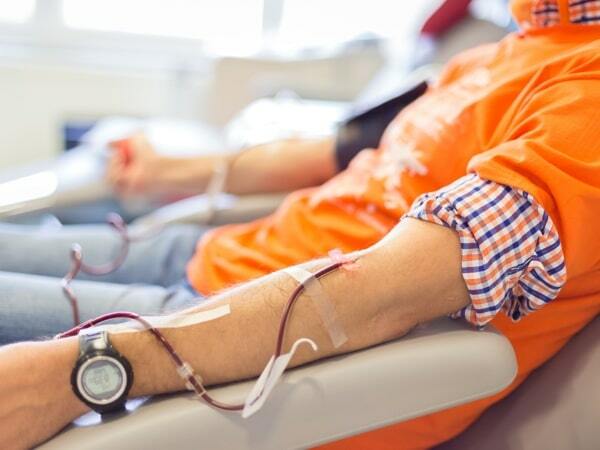 This document proposed numerous changes to the regulations for processes surrounding blood, including donor collection in ways that impact male donor eligibility. We’ll circle back to that in a moment. To finish the story, seven and a half years later (after many, many comments submitted by blood centers), in May 2015, FDA finally released the final version of this document (we will call it the “Final Rule”), with an effective date of May 23, 2016. Since FDA Final Rules are considered “law” in the United States, these changes are not optional. What does the Final Rule say? The Final Rule itself, in classic government fashion, is a 66-page, triple-column, single-spaced, horrible beast of a document. There are numerous required changes to current practices (way too many to outline here), and U.S. blood establishments are scrambling to update procedures to comply with the changes before May 2016. Let’s focus specifically on the issue of male blood donors: All voluntary blood donors are tested before donation to ensure they have adequate hemoglobin levels to minimize their risk of harm from donating blood. As of today, the minimum hemoglobin level at which a potential U.S. donor qualifies to give blood is 12.5 mg/dL (or for facilities that measure hematocrit instead, the minimum hematocrit is 38%). This cutoff is the same for both males and females, and applies to every donor, regardless of age, if the donor is 17, 27, or 87. However, the Final Rule raises that threshold from 12.5 mg/dL (38%) to 13.0 g/dL (39%), but only for males. Using the same hemoglobin criteria for male and female donors has been a potential problem for some time now, for several reasons. First, a male with a hemoglobin level of 12.5 (who is perfectly qualified under today’s donor criteria), is (wait for it): ANEMIC! According to the World Health Organization (WHO), any male with a hemoglobin below 13.0 is anemic. So, for decades, we have allowed anemic males with hemoglobin levels between 12.5 and 13 to donate blood! Third, and this is important, so pay attention: Checking hemoglobin level is NOT the same thing as assessing a donor’s iron stores! When someone becomes iron deficient, hemoglobin level (easily assessed in routine, pre-donation testing) falls considerably slower than ferritin level (or “stored iron,” which is not a routine test in blood donors). As a result, “normal” hemoglobin does not always mean that the donor has normal iron stores. That fact has been shown repeatedly in studies showing a significant proportion of both male and female blood donors who are qualified to donate by hemoglobin level actually have depleted iron stores (see the “RISE” study referenced below). So, we have a problem with current criteria, and the problem isn’t new. Many possible solutions have been proposed, including lengthening the time between blood donations, monitoring repeat donors for laboratory evidence of iron deficiency, and supplying oral iron to repeat donors. Despite numerous recommendations (including AABB Association Bulletin 12-03, suggesting that blood collectors consider things like recommending or supplying donors with oral iron supplements, measuring ferritin levels, or making frequent donors wait longer to donate), the industry has not yet agreed on a uniform approach. Does the Final Rule fix everything? The portion of the Final Rule dealing with donor hemoglobin criteria represents FDA’s solution to the issue. The new minimum cutoff of 13.0 g/dL hemoglobin or 39% hematocrit for males (a 0.5 g/dL increase in hemoglobin and a 1% increase in hematocrit over the previous requirement) will certainly lead to a loss of previously qualified male donors (“Dude, I’m anemic??”). We don’t know with certainty just how many will be affected, but my personal belief from a quick look at data from a California blood center is that this will affect less than 2% of male donors. Such a decrease would have an impact on blood supply, but the effect would likely not be devastating. Now, I know what you must be thinking: Clearly, since FDA followed the WHO definition and RAISED the male donor hemoglobin cutoff to 13.0, they must have gone ahead and DROPPED the female requirement to 12.0, right? It makes sense, but that is NOT what FDA chose to do. In the Final Rule, FDA states that they would maintain the “current requirements for hemoglobin and hematocrits for female donors [12.5 hemoglobin/38% hematocrit].” Confused? 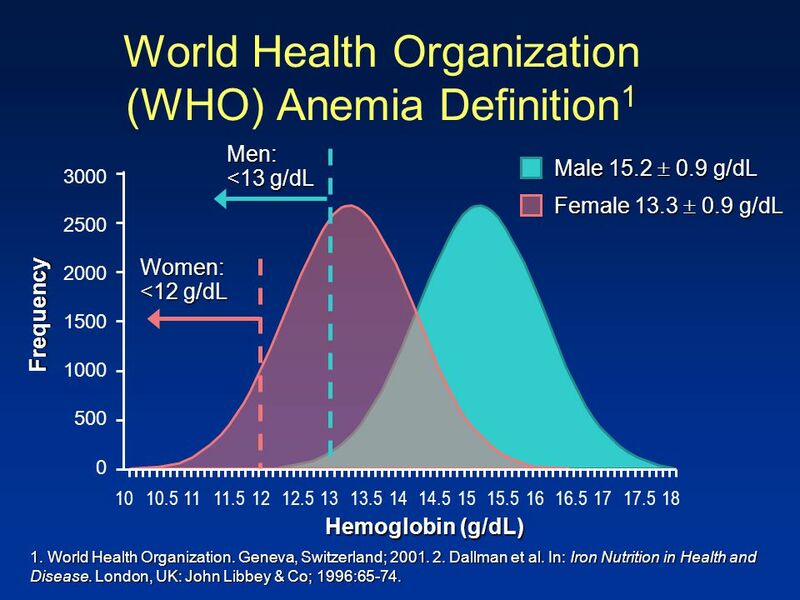 No rationale was offered, but my suspicion is that FDA chose not to change the level for females because females have a higher incidence of iron deficiency at hemoglobin 12.5 than males already, and they were concerned that decreasing the cutoff might worsen the situation. Does the Final Rule offer any other options? FDA did offer one little loophole in the Final Rule. Blood collection facilities are permitted to drop the female donor cutoff to 12.0 hemoglobin/36% hematocrit, “provided that the establishment has taken additional steps to assure that the alternative standard is adequate to assure donor safety, in accordance with a procedure that has been found acceptable for this purpose by FDA” (emphasis added). As of this writing, blood centers are still struggling to figure out just what kind of procedure WILL be found acceptable by the FDA (will it include providing iron supplements to female donors? Will centers have to check ferritin levels or lengthen deferral periods for females?). Whatever is ultimately approved, I will tell you that if females are allowed to donate at lower hemoglobin levels, we would gain FAR more female donors than the males lost by raising the male threshold. In plain English: There are WAY more females with hemoglobin levels between 12.0 and 12.5 than there are males between 12.5 and 13.0! We know this for sure: On May 23, 2016, all U.S. blood collection centers will lose a small proportion of their male donors who were previously eligible. At the same time, we have an opportunity to develop programs that will potentially make blood donation safer for female blood donors while at the same time increasing our pool of available donors. Certainly, all blood centers (including mine) are evaluating options and creating strategies as I write this. How do you feel about these changes? Feel free to sound off in the comment section! FDA Final Rule, “Requirements for Human Blood and Blood Components Intended for Transfusion or for Further Manufacturing Use,”; I dare you! Thank you for the easy to understand explanation of this new FDA requirement. This information will help me explain the new rules in simple terms that my blood donors can understand. I’ve been in blood banking 25 years and we have never had an issue with at male hct of 38% causing any health issues. Most will tell you they feel better. Now, we will defer more male donors in an already difficult environment to get donors. All the FDA did was weaken our blood supply. Well, Susan, part of me agrees with you, because I’ve been doing blood banking for a similar time, and I’ve never seen an issue either! But the key word there is seen! FDA’s position, supported by studies of long-term donors, is that if you are only looking at hemoglobin/hematocrit, you are not really seeing overall iron stores, and could be missing iron depletion. I’m not trying to defend them, but that’s their idea, and to be fair, they didn’t just pull that out of a vacuum! The RISE study (Cable et al, TRANSFUSION 2012;52:702-711) showed substantial proportions of iron deficiency in male donors (admittedly, less than in females), and our industry has been talking about either lengthening the donation interval or changing the baseline hematocrit for some time now (this is summarized very well by Dr. Jed Gorlin in an editorial in Transfusion; see TRANSFUSION 2014;54:747-749). So, agree or not, this is not a new issue or one FDA came up with on their own. but spinach is so delicious. I like it over any other salad. As a regular (230+ units) platelet donor, I am extremely frustrated by this change. I am a healthy, athletic adult male. Because of my physical training, my pulse rate is normally below 50 (athletically desirable, right? ), and FDA no-no. My weight (225 lb.) means that I have much more (2x?) blood than the minimum 110 lb. donor. On top of which, by my observation, I am not losing very many RBC during a platelet/plasma donation. I am borderline low on most metabolic and blood count measures during my annual physical. The reality is that I can do a seven or eight hour bike ride of 100+ miles without any metabolic repercussions…I guess I have enough oxygen carrying hemoglobin for that challenge. Unfortunately, I am being told that I now should take an iron supplement in order to continue my life-long pattern of blood donation to save other people’s lives. What is wrong with this picture? Gerry, I completely understand your frustration. The fact that your pulse runs below 50 is not an absolute disqualification in FDA’s eyes, but rather something that has to be evaluated before you can donate. Different blood collecting organizations handle that scenario differently, but in most centers, you would be allowed to donate. The borderline hemoglobin/hematocrit level is different, as you know. FDA wants maximum donor safety, and I can’t fault them for that (as I mentioned above, a male with a hemoglobin of 12.5 is, in fact, anemic!). Unfortunately, in that quest for safety, it is inevitable that we are going to have donors like you that fall right on the new borderline. I hope that you will go the extra mile and continue to donate despite this change; what you have done already as a donor has unquestionably saved countless lives! I feel your pain Gerry. I’ve consistently donated for decades. I’m an athlete with a low heart rate. I’m not as big as you, but dropping a pint of blood has never caused me to skip a workout except for the day of donation. This reminds me of BMI charts. You might actually qualify as “Obese” along with being “Anemic”. I do… and my main hobby is Rock Climbing. We all know that the Rock Climbing world is filled with the obese and anemic (he says sarcastically). I’ll give it 2-3 more tries before I give up donating, but I’ve been on the borders on this certain guideline for years and I suspect I’ll be done even trying soon. Doug, as I mentioned to Gerry, the heart rate issue is not a problem in most centers (it just requires a medical director approval, and most medical directors will do so for athletes). Unfortunately, if the issue is a borderline hematocrit, there’s just no fighting that one, as it is a non-waivable thing for U.S. blood center directors. I hope that you don’t give up; we need you! Thanks for the layman view of the new requirements. As a 20 plus gallon donor (blood and platelet combined) about three quarters of them would be rejected by the new standards.Joe, Did you ever come across any of the studies that showed the correlation to heart attacks between men and women and how they intersect after women became post-menopausal, given the higher iron levels in men as the possible common denominator ? Larry, every blood bank physician is aware of those reports, but unfortunately, no one has been able to prove that blood donation is the antidote to the possible detrimental effect of iron. It’s a tough thing to prove, and we really can’t make that claim at all (“donate blood, decrease your risk of myocardial infarction” is not a marketing slogan we can use). I’m sorry to hear about how much the new requirements may affect you, Larry, especially as a long-time donor. I hope that just a slight increase in your hemoglobin/hematocrit is possible for you; I’m sure that the center where you donate would hate to lose a dedicated donor like you! As a nurse working in a blood bank, I think this is a very good idea. Lots of our male donors end up getting bloodwork done by their physicians (it always seems to happen just after they donate too!) who find that they are very anemic (hemoglobin less than 120). This is so unusual for men, that they often get a full (perhaps unnecessary) work-up because the clients forget to tell their physicians that they are regular blood donors! Moving forward, I hope we start checking ferritin level as well. Thanks for your comment. I understand the sentiment, and certainly share your concern for ensuring the safety of blood donors everywhere! As I mentioned in the post, checking hemoglobin/hematocrit for our donors is a really low-sensitivity way to really see what is going on, and numerous studies have demonstrated at least some degree of iron deficiency in repeat blood donors. It’s something that we will have to keep evaluating, for sure, and ferritin may play a part in that evaluation. As someone who scored a 12.8 today, I’m probably done. Here’s the thing boys and girls, if I had allowed them poke another finger or two, they probably would have scored at least one 13 or higher. If the tests are that inaccurate and undependable, what the hell good are they? I’ve donated close to 100 times and only had an issue once in stifling hot donation center. If someone is that close to the limit and tests aren’t accurate anyway, let me sign a waiver so I can do my donation. Frank, as a blood center medical director, I completely understand your frustration. You are correct that there is a margin for error in fingerstick hemoglobin testing and some variation (though blood centers work very hard to minimize that variation). This is true of any laboratory test and any biological system, unfortunately (the same would be true if your blood were tested in a laboratory; all biological systems will have built-in variability). Whether or not to try again is obviously your decision, but I would hate to see someone who has been as dedicated as you have been stop donating as a result of this. Unfortunately, premenopausal ladies have been dealing with this frustration (being right above or right below the 12.5 cutoff for them) for decades, but it is new for most of our male donors. Again, your call, but I hope that you will discuss this with your local blood center safe ways to bump up that hemoglobin a little bit. Thank you so much for your contributions; you have unquestionably saved many lives, and I hope that you won’t give up! It is a little frustrating for me. I have donated 90+ times an donly 3 times I have been 13 or higher. I have tried most else..maybe I should try iron supplements…I was reluctant to do so. but it is worth it if I can still donate. Hi, Paul! I’m not sure how I missed these comments, but I did! Low-dose iron supplements are actually a pretty good choice for people that can take them (everyone should check with their doctor first). Glad it’s working for you! Here in Greece we have the 12.5 cutoff for women and 13.5 for men…I think we should lower it for men to 13.0 as well in order to gain more donors! Count this male out. This change brings my regular blood donations to an end. Its just way too much trouble to go through all the Q&A to get to the end of the process and test out at 12.8 and be sent packing. Now if they would do the test first, then I will reconsider my boycott. Steve, I’m very sorry to hear that you feel that way. I understand, of course, how frustrating it can be to go through the process and then find out that your hemoglobin is below the threshold. If you will permit me, though, let me point out several things. First, doing the hemoglobin after all of the questions is not mandatory (in other words, no regulatory body says that the questions HAVE to come before the physical exam part of the donor evaluation). As a result, it may be worthwhile to contact your local blood collector and give them your feedback about the process. Not every center does the questions first, and there may be some flexibility. Second, the frustration you are feeling is exactly what most females of child-bearing age have been dealing with for YEARS! Because of their monthly cycles, females below age 50 or so have always been much more at risk for not making the minimum hemoglobin threshold, and it is quite common for them to come in to donate not knowing whether or not they are going to “make it,” yet they still come in. Finally, and I say this as respectfully as I can, because I honor your commitment to donating in the past: I am guessing that when you started donating, it was because you really wanted to help someone. Perhaps there was someone specific in mind for you at the beginning, or somewhere along the way. Most donors have a story like that, and even if they don’t, they donate because they have good intentions, and they know that someone somewhere, someone that they will likely never meet, truly NEEDS their blood! Blood donors are remarkably great people, and I’m sure that you are as well, since you are a donor. Let me assure you, Steve, that the need is still real, the need is still great, and the need may go unmet if you stop donating! I don’t write this to try to give you guilt, I promise; rather, I write it to tell you that there is a patient out there who still needs you! I hope that you will reconsider. If not, I salute your previous contributions and wish you the very best. I’m with Steve. I had over 70 donations before the rule change with one iron deferral in all that time. I’ve now been deferred 4 of my last 6 visits, including a 12.9 today. Drinking less water, taking supplements, planning my meals… it would probably work if I remembered to do it. But I don’t. I guess I’m not smart enough to deal with the new FDA. I’m ticked off, and I’m done. p.s. I appreciate this article giving the explanation for the ruling. I wish my local blood bank had provided something similar when the rule changed. I used to donate blood and was once told that if my hemoglobin was any lower that I would not be allowed to donate blood. Donating blood hurt my running performance for about a month. It seems to me that if you are at the bottom of the normal range with a hemoglobin of 13 or hematocrit of 39%, even using the new standards you will then be anemic after giving a pint of blood. Are we more concerned about those who will receive blood than those who give it? I recently had a sever GI bleed with a hemoglobin of 7. The doctors said it was more dangerous for me to receive an infusion of blood than for me to build up my own blood. What is going on with the blood supply anyway? Hi, Dale. I understand your concern. Let me tell you plainly that we are absolutely as concerned about our donors as as our recipients! I feel that my duty as medical director of a blood donor center extends equally to both donors and those who get their blood, and I take that responsibility very seriously. That is why donors are kept from donating too often, and that is why FDA has made the change that this post describes. Further, that is why blood centers in the U.S. are starting to get more serious about discussing iron deficiency with our regular donors. Most healthy donors recover pretty quickly from blood donation, though as I am a runner (probably not nearly as good a runner as you! ), I agree that donating affects performance for a time (for me, about a week, though, as I said, I’m not a competitive runner). We take it very seriously, and we are always learning how to do things better. As for your second point, current research suggests that recipients of blood can tolerate hemoglobin levels down to 7 without putting them at significant risk. For that reason, doctors around the world are avoiding transfusion in situations that they would have given blood in the past. Think of it this way: If you are trying to decide whether or not to give a patient a drug, and you realized that the patient would be just fine without that drug, you would probably avoid it, right? Well, to us, blood is a drug. It doesn’t mean that the blood supply is unsafe; far from it, in fact. The blood supply has never been safer, but we are learning to use blood only when it is really needed. As I’m sure you noticed after your GI bleed, having a hemoglobin of 7 does not make you feel like going out and doing cartwheels, but according to some really great studies that have been done, it is completely safe, and transfusion can be reserved for others that are at greater risk of losing their life if not transfused. I truly hope that you have recovered, Dale, and that you are feeling better now. I’m sorry that you had to go through that experience with your GI bleed. I wish you the best, and thank you very much for writing. Very good article. donating blood is not just giving a unit of blood. it’s saving a life. Everyone should donate blood in their life at least twice a year. It keeps your blood clean and fresh. So the chances of getting diseases will be narrow. Thanks, Bharath. I should state clearly that blood donation is not definitively proven to make a donor healthier, so we have to be very careful in the promises that we make to blood donors. I assume these standards are meant to obtain the most consistently useful/good quality blood from the most donors. While a hemoglobin of 11.0 shouldn’t be a big deal, I find that I experience significant symptoms of anemia at that level. However, I routinely run around happily with a ferritin of less than 14, even when my hemoglobin exceeds 14 (although not by much), and ferritin seems to be a very poor indicator of anemia in my case. I’m not male, so the change in standards doesn’t directly affect me. Allowing female donors to donate at a hemoglobin of 12.0 would affect me, because donation of one unit would pitch me right into symptomatic anemia, and I am definitely stupid enough to donate in such a situation. We won’t count how many times I have donated myself into anemia in the past. It’s sad to read comments of so many guys saying they will no longer donate. As a female I’ve been turned down many times so I understand the feeling of being unacceptable to donate. Instead of being discouraged I use my low haemoglobin result to encourage me to increase iron rich foods in my diet. Remember the WHO recommends 13 as the cut-off for males for good reason. I wonder why the U.S previously used the cut off of 12.5 for males. It’s beneficial to the you guys not to donate with hbg < 13. Remember there is still no substitute for blood and the need for blood is no respecter of persons. Either of us may need it at any time so let make it available for all by donating if we can. There’s been articles talking about normal hemoglobin level not always equate to normal iron stored in body. Say a donor proceeds with donation thinking all is normal, does blood bank perform CBC and make sure all blood cells are within normal, and /or notify donor if necessary??? Karen, you are correct that hemoglobin levels do not always correlate to iron stores; in fact, there is a definite lag. That is why this issue is being carefully studied and evaluated for blood donors all around the world. In general, blood collectors do not perform CBCs on donors, and frankly, doing so would provide minimal additional information regarding iron stores in most cases. Again, this is something that is evolving everywhere, and we are trying to protect our donors as best we can. Again, Karen, generally speaking, blood banks do not check white blood cell counts. Most assume good health if the person is feeling well and passes all the screening criteria. As I mentioned, there is lots of current discussion about this, especially with iron stores. WBC counts can certainly fluctuate, from day to day or even hour to hour, so I’m not sure I personally would assume that a decline in WBC count from the year before is due to blood donation. That, however, is most appropriately discussed with your personal doctor, as you are doing. My husband and I (both early sixties) are regular whole blood donors. Yesterday, for the first time ever, he was deferred due to low hemoglobin. That surprised us both as we hadn’t been aware of the change in acceptable levels for males, and the staff at the donation center didn’t mention it. We were reassured to find your article which helps explain what may have happened yesterday and takes the edge off of some of the concerns we’d been imagining what could be causing his “low” level (12.5). I was also interested to read in your article about ferritin. While donating yesterday, my phlebotomist mentioned something about how the FDA has (or will soon have) new requirements for checking ferritin levels in some people. She seemed unsure as to whether it is only females, only age 19 and under, or for everyone. I found this interesting as I’d recently learned that while my hemoglobin is typically fine, my ferritin is very low. For instance, ferritin 16.1 ng/mL with hemoglobin 13.5 g/dL, and after two months of taking one 325 mg ferrous sulfate supplement per day, ferritin had risen to 30.9 ng/mL (still considered on the lower end) with hemoglobin 13.3 g/dL/. I may be someone whose ferritin levels should be checked before I am allowed to continue donating! I looked online for more information about current Red Cross requirements on this testing but was unable to find anything. Sue, my apologies for missing this last year when it came out! Ferritin testing may be something that is done by all centers in the future; for now, it is only being done by some, and is not a requirement. I have been a regular blood donor for about 50 years. I just turned 70, and planned to continue giving. Today was the first time I had any issue with the hemoglobin test. It was 12.8 initially, but when another sample was taken from a finger on the other hand it was 13.5. That was enough to get me accepted. Seems like any test with that much variability is questionable. There are several interesting things I take from your comment, not the least of which is that most blood centers will not test a sample from a second finger to try to gain an acceptable result. Either way, you are correct that there is variability in the performance of fingerstick hemoglobin tests. All lab tests have variability, of course, and a fingerstick test may be prone to more than some others because it is very dependent on the technique of the person performing the fingerstick (squeeeeeze the finger too hard, for example, and the hemoglobin may be falsely low). I honor your dedication to donation, and I hope you won’t let this one experience discourage you from continuing to make a difference in the lives of the patients on the receiving end! I just tried to donate yesterday and was turned away. First stick was 12.5 and the second was 12.9. I was scheduled to donate platelets which returns the red blood cells. I wish I could help save someone else’s life than being turned away for a .1 disqualifier. A reading of 12.9 will not kill me but being turned away may kill someone else. I walked away very said and disappointed that someone may die because f me. Robin, I understand your frustration, I really do. The thing that is very important to remember in this process is that we in blood donor centers are of course doing everything we can to protect patients that will receive the blood, but we have an equal responsibility to protect our donors. I will not insult your intelligence and argue that having a hemoglobin of 12.9 g/dL is significantly worse than having one of 13.0. They are, in fact, functionally the same. However, as I mentioned in this post, we have to have thresholds! FDA has set those for us, and we don’t have “wiggle room” with them. The idea is to protect our donors from donating when doing so might harm them. FDA had to set that threshold somewhere and we have to stick to it. Regarding your last two sentences, I would caution you against taking too much on your own shoulders. The wonderful thing about blood donors is that they are great at stepping up when products are needed, and I have no doubt that someone in your area was able to give what you were not able to because of your hemoglobin level. Please don’t beat yourself up! I hope you can get past the disappointment and try again. We DO need you, and the fact that you feel the way you feel about not being able to donate tells me all I need to know about you! Best wishes, and thanks so much for being a blood donor.